Intelligent, good memory and reasoning faculty. Very capable of dealing with facts, possess good concentration, kind, humane, self controlled. Constant, preserving, happy disposition, inventive and also psychic. Have many friends. Can read other's characters, broad outlook and like solitude. They often become physicians. Aquarians are serious, quite, thoughtful and of contemplative nature. Defective teeth, intelligent, cautions, prudent, economical and practical. Outspoken, unselfish, humane and impersonal. They are very social but very choosey about friends. Hardworkers, have organising capacity, of profound thoughts, also shrewd, clear headed, quick-witted and wide awake. Blessed with new and fresh ideas, use own thinking and discretion,originate new ideas. Will do all things which are morally right. They have their own individually and speciality. Constant in friendship, stick to a principle. Best fitted for research and Physics. Aquarians are strong in their likes and dislikes. Stubborn but not fool hardy. they develop intuition and good concentration. They do not preach others but act themselves. They observe fast, penance etc. and sound financial position. Aquarians are prone to infectious diseases. Cannot withstand cold, they should attend immediately to an injury, should not overtax themselves and take plenty of rest. Venus isbadhakasthana whereas Jupiter and Sun are Maraka planets. Honour, wealth come to them. But they are both fortunate and unfortunate. They are neither very much attached nor detached with their family. Gemini and Libra born ladies are best suited as their partners. They will have good children The result indicated for Aquarius ascendant are firm and general for the different planets in the different houses. They are to be suitably modified. according to the aspects and conjunction with other planets. Aquarians are succeptable to infections diseases. One should not overtax oneself but take rest. The heart may cause trouble, it may be rheumatic or cause blood pressure. Tooth, throat and tonsil,swelling of legs, ankles feet and left ear troubles are also denoted. One may suffer from eye troubles. One should immediately consult a doctor in the case of even a minor trouble or ailment and one will recover from them when the disease is as indicated by Moon, but the diseases caused by Jupiter, Sun,Mercury and Venus in their conjoined period or sub period will be fatal.Moon causes dropsy and common ailments during its period being a lord of 6th house and planets posited in Dhanishta threatens high fever, malaria, high blood pressure fractures etc. Whereas planets in Satbhisha causes poor digestion or one suffers from constipation, blood pressure and insomnia.Planets in Poorvabadhra produce dropsy, defective blood circulation eczema, skin troubles, ulcerated gums etc. Venus is Bhadhaka-Sthana Adhipati Lords of 2nd and 7th are Maraka sthana adhipatis, they are Jupiter and Sun which affect longevity. Aquarians are intelligent and always prefer educated and equally intelligent partners. They move with all very freely but with those who are social equals they are shrewd and studious. They prefer permanent and strong attachments. They are unassuming, they do not boss over the partner. In case the person is not upto their standard they may slowly and without assigning any reasons discontinue the love relations and friendship.Aquarians do not show love and are cold, so the partners if are passionate they will not be satisfied. The partners will be law biding, true, honest and sincere, dutiful, magnanimous and noble. They care peace, harmony and happiness.Those who marry Aquarians, find them very humane, kind, sympathetic and accommodative and generous and gracious. Aquarian husbands are intelligent and ever think and carry research in science etc. so they have little time to pay full attention to the wife and family and may not be taken as a drawback and lack of interest to such wives who are selfish. Otherwise they are very humane, kind, sympathetic, accommodative, generous and genius. They are harmonious husbands contributing for happy life.They are strict teachers and treat their children as grown up individuals who are respectful and affectionate to the parents. They educate them and encourage them to be bold and expressive. They become clever and versatile,but expect respect from them. If either the ascendant or Saturn, the lord the ascendant,is afflicted by the adverse aspect from any planet. 1. The native will be lazy and lethargic, and hence he should cultivate activity, promptness etc. 2. He should avoid solitude. 3. He should not be worried, gloomy and pessimist. 4.He should be pushful and alert. 5. He should not be very rigid towards those whom the Aquarians dislike. Honour comes to them, Aquarians never seek them.They are both fortunate and unfortunate. They work hard and wait patiently for some development and novel results and then only expect money. To money, they consider, that it is only needed for worldly life. Aquarians are very social, they keep the home clean and tidy, well furnished, modern fashionable home. Fond of entertaining friends and collecting more and more antiques. They are in the habit of adaptability.Unconventional but adopt modern methods to save time and trouble. They prefer society and solitude, more dutiful to their relatives, they are neither much attached nor detached. 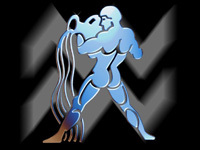 Aquarians are always lively, good humorous, high spirited and cheerful. They want many friends, and are almost reliable, sincere and good but with some of them they might be somewhat reserved. They are not in habit of finding fault with others but take everything easy. Good partners in business. They should be careful for selection of friends and some of them may not be selfish or cheat and so avoid too much intimacy with others and all Aquarians should be quite and unassuming which will enable them to make a large number of friends and make the home pleasant. 2nd house lord Jupiter indicates the professions for Aquarians can be scientist, good executive, position in large office or concerns, a lecturer, astrologer, legal, financial or education advisor. Mine contractor, or dealer in shipping and export.6th house lord Moon indicates one may practice in medicine, social service,shipping, sailor, submarine, pump set dealer, export and import business of liquids.10th house lord Mars denotes the professions of building construction,chemicals, mechanical engineering, brick kiln owner, cement dealer, surgeon,dealer in lead, copper and steel or C.I.D. officer. The professions will also be of the planets forming good aspects with cusps of 2nd, 6th and 10th houses. Lucky Days, Numbers, Colours and Stones Etc. Thursdays, Friday,Tuesday and Mondays are favourable and lucky days. Wednesdays and Saturday are unfortunate whereas Sunday offer mixed results.Lucky Colours. Yellow, Red, White and Cream are lucky and favourable colours. Avoid orange, green and blue.Lucky Numbers. Favourable and lucky numbers 3,9,2 and 7. But unfavourable number are 1,4,5 and 8. Passive number is 6.Lucky Stone. Blue sapphire is lucky stone for Aquarians and should be used in gold or in five metals ring and be worn in 2nd finger of right hand on Saturday morning after offering payer.In case Saturn in unfavourable or afflicted one should use Blue Sapphire,blue Red Coral or Blue Sapphire plus emerald as above. Good and Thanks.it's a 90% is match with me and accurate description.but i want to about dhanishta nakshatra.if know that pls share it. Am purchase diamond mine Aquarius it use incase any problem come to me pls reply. This one of the most accurate description I have seen of Aquarius ruled persons. Thank you so much for posting this. being someone with an aquarius ascendant in my lagna chart Ihad a number of people analyse it but most have not been able to hit the nail on the head as you have.